David Granatstein has served as Sustainable Agriculture Specialist at Washington State University since 1993. He was hired then as the first full-time faculty member in the newly formed Center for Sustaining Agriculture and Natural Resources, with his administrative home in WSU Extension Agriculture and Natural Resources. He has worked statewide out of the WSU Tree Fruit Research and Extension Center in Wenatchee, WA, and has spent a significant portion of time on orchard issues, particularly orchard floor management and soil health, and development of the organic tree fruit sector. 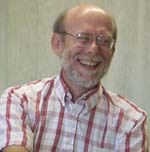 He was a principle in a number of large efforts, including the Organic Crop Research Special Grant, development of the BIOAg program, the formation and implementation of the Food Alliance, The Compost Education and Resources for Western Agriculture project, the Climate Friendly Farming project, and the initial biochar research project. Prior to his Wenatchee position, he worked in Pullman for four years managing the Northwest Dryland Cereal-Legume project funded by USDA-SARE, and he spent two years as on-farm research director with the Land Stewardship Project in Lewistown, Minnesota.